What is your current regimen and what are you go-to products? My regimen is pretty simple. I shampoo with Suave Clarifying, then follow with Suave Almond and Shea and Garnier Fruictis Triple Nutrition. Then I condition with Aussie Moist, Garnier Fructis Triple nutrition, Pantene Nature Fusion Moisture Balance, Pantene Beautiful Lengths and Dove Intense Moisture. During the week I work out, so I leave the conditioner in and put my hair up into a donut or a french braid. Then by Thursday, if I have plans for the weekend, I’ll rinse the conditioner, shampoo again with the Triple Nutrition then style. Believe it or not, I use a lot of over the counter products. One of my favorites is Aussie 3 Minute Miracle!! 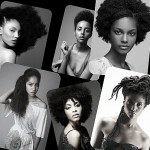 What are your go-to hairstyles, and how do you get your signature ‘fro? My go to hairstyle is either a donut, french braids or a two stranded twist. 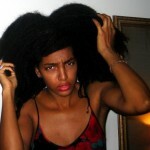 As for my Afro, in the winter is the best time to wear it! My own personal earmuffs! I shampoo, condition then put it into two French braids. Let them air dry, then take them loose, add a little moisturizer, then pick them out one at a time. I spray a little water on it to shape it to my liking. What advice would you give women who are just beginning their own natural hair journey? Patience, deep conditioning and creativity! What a beauty!!! I am in LOOOOOOOOOVE with her hair. Just stunning!!! I actually thought that you would take the record! I have seen that pic floating around for a while. Is that her real hair? 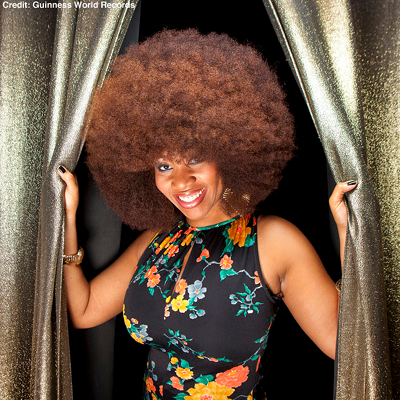 I don’t know…When I heard Guinness World Records had a record for the biggest fro I thought about this woman so either that’s not her hair or she didn’t submit. ohhh ok…cool, do you know her name? nope, it’s all hers. She’s a friend of mine. MMM, it does not look real! I wonder how long her hair is stretched?